I’m occasionally asked what I miss most about drift-netting for Salmon. When it stopped in 2006 I was fishing on a part time basis, but I refused to participate in the buy out of licences, preferring instead to hope for a return. So when I answer, I’m usually a bit off hand and probably say something straightforward and easy to understand, such as the thrill of landing a large fish. But if I was honest what I miss about fishing is complex. A way of life is hard to quantify and communicate in a few sentences. It has elements of relationships, boat handling, fishing nous, traditions, and experiencing nature and weather on a ongoing basis that you just don’t appreciate to the same extent on land. 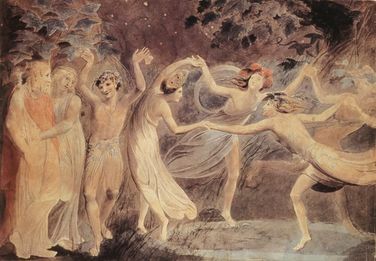 A great example of this is the Si Gaoithe, or the Fairy wind. I think I was sixteen when I first encountered the Si Gaoithe. I was the boy that season with Michael Barry of the High Street, which would have made this event occurring in the summer of 1982. It was one of those beautiful sunny and still summer days, which are so rare when fishing. So dry and calm, that you can forgo the oilskins and woolly jumpers, and controlling the punt was a lot less of a challenge, having only tidal conditions to contend with. 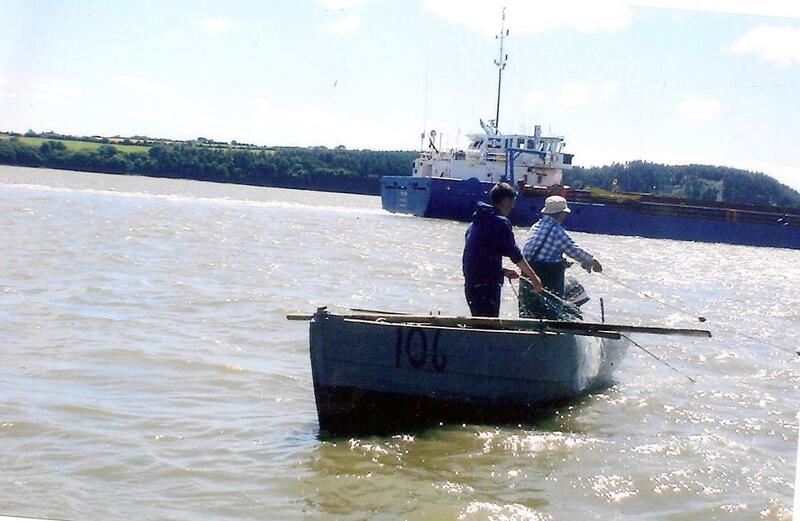 It was nearing high water, and we had the nets out on “the mud”, the Shelburne Bank, on the Wexford side of the rivers. We had opted to leave the nets where they were lying, virtually static at this point given the time of tide, and joined several other punts on the “bank wall” – the embankment constructed around the Marsh on Great Island. There we lay out on the warm summer grass keeping a constant watch on the nets for signs of a fish and swapped stories. Below us other punts were with their nets, whilst at Nook the Whitty’s were in their usual perch on the grassy bank overlooking their bay, monitoring the nets at the Big rock or the Knock. Suddenly all hell broke loose. One of the punts was rocking and a voice could be heard in high animation. Despite the distance, it was clearly the punt of Christy Doherty (RIP) and there was some talk that Christy must have “lost it” or perhaps had landed a “pig of a salmon” our parlance for a very large fish. Anyway, I was old enough to realise whatever was going on Christy Doherty was not a man to either “loose it” or get over excited. Christy and his brothers were highly regarded in our house. One of the stories I heard of him fishing was one night in winter, he went to the Sheag Weir, an old ebb weir just below the quay of Cheekpoint. The wind was northerly, and it was freshening all the time. Christy was emptying the net when a squall came on and the punt sunk beneath him. If I recall right he couldn’t swim, and of course would not have had a lifejacket, so he pulled himself up the weir net and eventually managed to climb the weir poles to the head of the weir where he settled down to await daylight. When several hours later he was found, despite the wet and stinging cold, his only complaint was that he hadn’t had a cigarette in hours! I experienced the magic that Christy described several times later. My lasting memory was one I shared with our son, Joel. He was only a boy of about eight and we were drifting on the ebb tide one beautiful calm summer evening. Again not a liu of wind, and the river surface was like glass. Joel was chatting away and searching the bottom of the boat for a crab whilst I kept a close eye on the nets. Suddenly around us little whisps of straw started to fall. I jumped with joy to see it, and explained what we were experiencing to Joel. Looking up into the sky, we could see hundreds of little pieces of straw cascading down upon our general direction, and as they fell Joel tried to capture some of them. The straws were falling from out of a clear blue evening sky, from about 100 feet up, although very hard to judge. We followed the line of straw with our eyes, as it went horizontally from above our position in towards the Wexford shore. We were passing Nook at the time, and we could clearly see the line of straw heading in over the land and then trace it back down to a field recently harvested with straw lined up waiting to be bailed. Amongst this a mysterious wind was whipping up loose pieces of straw into mini whirlwinds, carrying it into the sky. Witnessing such events is a privilege, one that I haven’t seen since we stopped fishing. It may seem like I’m fooling myself, but I still believe today as I did in 2006, that I would one day be back on the river and I am not going to loose sight of that anytime soon. This morning, the Morgenster, a Dutch two masted, square rigged, sailing ship will enter Waterford Harbour with her crew and 30+ trainees aboard. She is sailing under the auspices of Sail Training Ireland and on Saturday she will be open to the public to mark the 200 year anniversary of the Port and as a fundraiser for Waterford City River Rescue. Tickets for a groups of four are available for €10. Waterford In Your Pocket has all the details. 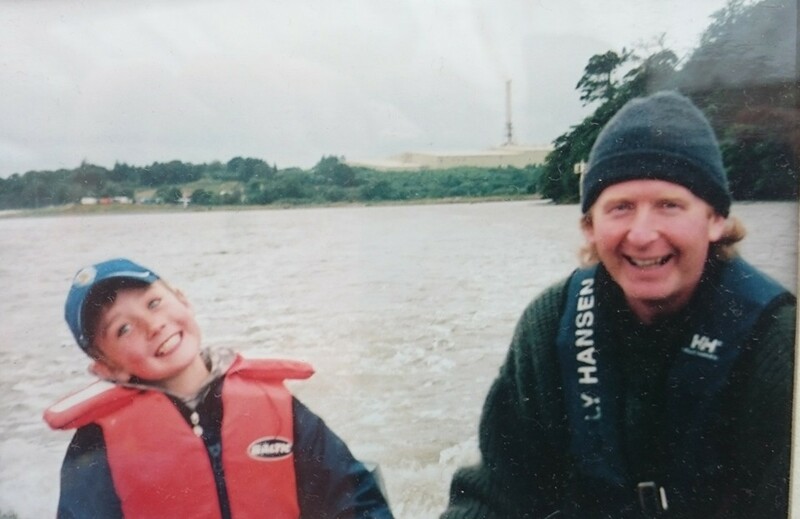 But apart from the magic of seeing a tall ship in the harbour, or a fundraiser for one of our favourite charities, what makes it so special is that our eldest daughter Hannah will be one of the trainee sailors aboard. She shipped out last Sunday evening, from Cobh in Co Cork. I mentioned Cobh before on the blog, because it was a departure point for many of the family who never returned. I’ve always found it a emotive location. It was all the more so to us as we walked towards the pier with our daughter. Hannah was fortunate of course. An email from a singing buddy, Breda with the Waterford Women’s Centre had caused her much excitement. It spoke of an opportunity to have a bursary towards a sailing experience, with the assistance of Waterford Area Partnership, Waterford Port Authority and the Council. She had the choice of applying for a five or sixteen day trip. She ticked the latter and sent it off. 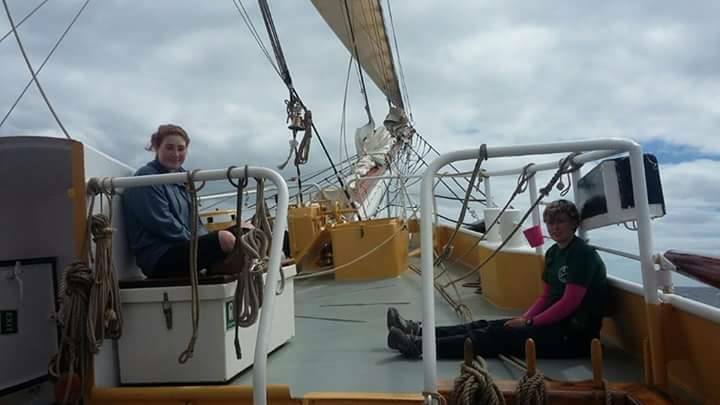 A week before we had heard nothing, and so following a few calls and social media call messages, Alina from Sail Training Ireland came back and suddenly rather than speculation it was planning! Hannah was a little unsure coming closer to last weekend. Was it all a bit rushed, would she have the right equipment, how would she really get on. Although unspoken, we both shared her fears and more. However, remaining quiet and trying to be supportive we gave what encouragement we could. It was after all her decision. Coincidentally, or was it something more, a few weeks before my mother had passed on a family memento to me for safekeeping. Taking it down, I passed it over to her. She placed her hand into it and I explained what it was used for. It instantly relaxed her, almost as if the physical action of connecting with the weathered leather, imbued with the blood, sweat and seawater of generations, eased her mind and grounded her. What was so special about her, was that she was the last ship to ply the southern Irish coast without auxiliary power. Tom MacSweeney gives a great sense of what that means in this extract about her. Unfortunately I never got to ask my father just what his connection to the Brooklands was, but I imagine there were Cheekpoint men sailing her from time to time. Another possibility, is that whilst dropping a cargo of coal to Cheekpoint, or awaiting a favourable wind, my father was aboard hearing the yarns of the sailors that he would one day want to emulate. I’m well aware of the numbers of such ships that entered and left the harbour. Growing up in the forties my father had a front row seat to witnessing the dying tradition of sailing “before the mast”. I asked him often if he would have liked to try it but I recall him always changing the subject or dismissing the suggestion. He told me the last man that he knew in Cheekpoint who had sailed such ships was Larry Cassin on the old road. Larry worked at the time in the Harbour Board, and to my eternal dismay I never made it my business to call to him and ask about it before he died. As we turned to leave Hannah was in two minds. That uncertainty was back. Eventually she said “I’m scared, but I’d feel worse driving home not knowing what I missed” How many others uttered the same words at Cobh through the generations I wondered. 1&2. Irish. B & Kelly A. Two Centuries of Tall Ships in Waterford. 2011. Rectory Press. Portlaw. Adults can sometimes be guilty, inadvertently in fairness, of causing deep confusion in youngsters. 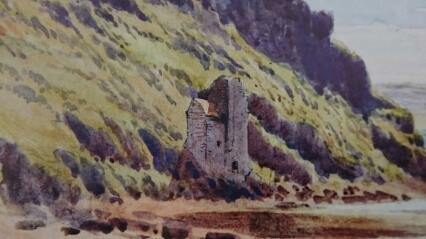 An example I can recall was the placename “Buttermilk Castle” or more common with the fishermen simply “the Castle”. 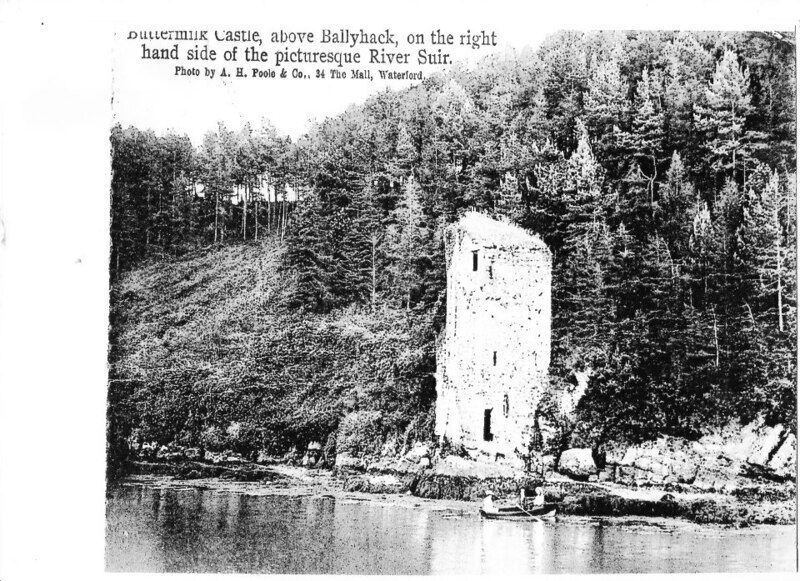 The Castle was formidable lump of rock and forestery that jutted out into the river directly across from the Russianside, just below Nuke in Co. Wexford. The associated fishing weir shared the name. The rock gave a sense of a citadel but when I sought further information my youthful questions were usually brushed aside. My confusion continued even after I started fishing, the Castle from which the name arose you see had crumbled into the cliff, and was swallowed up by the undergrowth. My first introduction to the Castle, came when visiting a wonderful maritime museum that was located at Duncannon Fort, back in the 90’s. 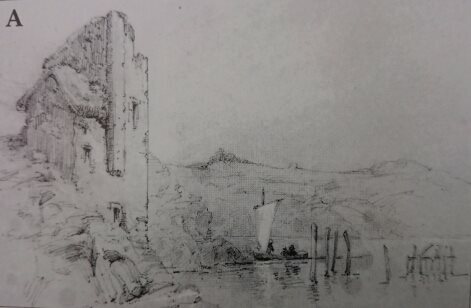 Alas no more now, it had a photograph, below, of the Castle, taken by AH Poole in the late 19th C. It depicted the familar square shaped Norman Tower house. It was before the coming of social media and the wonderful books of Billy Colfer, and it was a joy to me to finally see what for years I could only try imagine. It was well worth the £25 I paid! I personally lean towards the broader position, although for years I had accepted the fishing monks abode without question. In the first instance, it’s an elaborate build to keep the rain off fishermen. Towerhouses, were usually built for defense. The location would not protect it much from the land, but would certainly be formidably from the river. Was it more of a secure location, a place where business could be transacted and valuables stored. Of course, foreign fleets were also working the harbour and off the coast. Such fleets needed secure landing places to dry or salt their catch. Is it possible that it was an administrative centre for such activities. The monks certainly would have had the contacts. I wonder was the fact that we have two towerhouses so closely located, a sign of hostility. The tower at Ballyhack is most probably of Templar build, was there competition between both groups at a time in the past, for such trade . I also heard it described as a Toll House and indeed a Water Gate. I find the notion of a toll house fascinating. In modern times, we might think Buttermilk is a bit out of the way, but in medieval times what ships needed was a safe anchorage and would have sought out such places whilst waiting a cargo or a position in port. 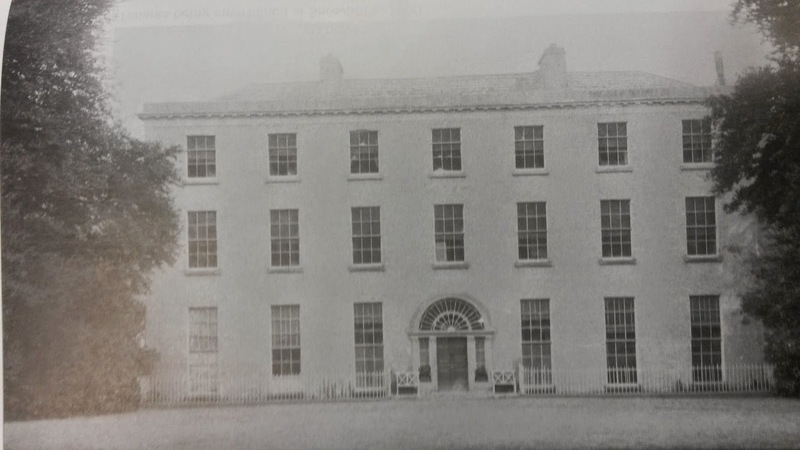 There could have been a possibility of a connection with Dunbrody or New Ross. An intriguing thought. Even in modern times the site is still highly regarded as a safe anchorage. Colfer says that the Tower was initially known as “Skeroirke Tower”, something that he speculates is a name of Norse origin, Skar being a word used for rock.6 Certainly appropriate given the outcropping, The name Buttermilk is a newer origin. I’ve never heard anyone speculate as to why a tower built to protect weirs, would be called after a dairy by-product. 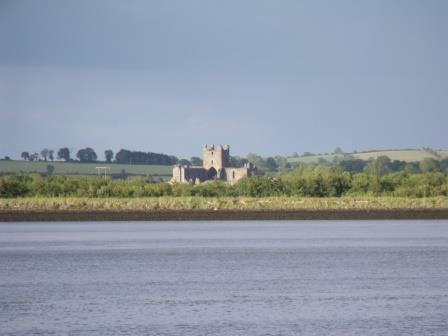 According to my Grandmother, the name of the castle comes from the fact that it was used to transport point between Dunbrody and Faithlegg. She said that butter was made on the site from milk gathered from the Waterford side of the harbour on a Faithlegg farm under their control. Whatever the truth of it, the reality is that over millennia, the chances are that Buttermilk Castle served several purposes, some of which we may never realise. Its just another one of those rich and fascinating placenames and sites we have in the harbour, which we need to explore. Waterford’s busy quays. The family spent some years at Ballycanvan, hence the family tomb at Faithlegg. her paddles, let off her steam, hauled in close to the hulk, and made fast. the Cistercians, Templers and Norman merchants brought to the harbour area. commercial importance, although perhaps waning at the time due to steam power. possible, such is his certainty in himself. cloying. Working via peaceful means to create a different republic. for insurrection than consciously and critically living their lives. 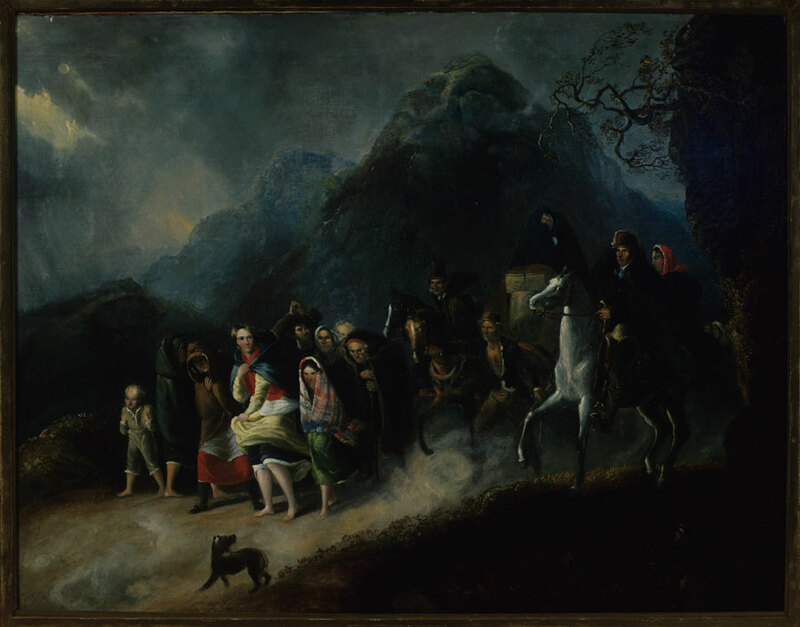 print, but is available in the Waterford room of the city’s Central Library. Certainly would be good to see it reprinted. numerous searches I could find no further information on the PS William Penn. Tommy Deegan and Frank Murphy were both helpful in providing some leads. Apart from Meaghers account, two other references to the ship exist. Bill’s book on Ship Building in Waterford as being owned or part owned by the Malcomson’s of Waterford.